All of the heavy series Wiss tailor's shears shown here have the "Simplex" shear bolt design which are easier to pull apart to clean and lubricate the hinge. They adjust more easily and accurately than the other common version. All of the models shown here were made in Newark New Jersey. This is a very good pair of Wiss #10 15.5 inch shears. They were sourced from Milwaukee in the US and were originally a presentation pair to an old tailor whose name was etched on the outside face of the upper blade and were made at about the beginning of WW1. They were a bit rusty but in very good condition and had never been sharpened or used. They have been fully restored and because of their weight and size are a very powerful pair of shears that are well suited for cutting very heavy fabrics. This pair were sourced in New York from an estate sale via a private collector. They a #9 15 inch pair of shears that date from shortly after WW1 and arrived in generally good condition. They are noticably lighter that the next size up and are well suited for cutting light to heavy suiting fabrics. They were "unrestored" from being a display piece, has minor repairs done to them, sharpened properly and fully refinished. For a pair of this size they are remarkable nimble and can cut most profiles as long as the curve is not too small. This pair of restored #8 14.5 inch shears were bought specifically for a professional cutter who had run out of shears in good enough condition to be used professionally. The handles were polished rather than painted at the request of the tailor who they were intended for even though this required more maintanance to prevent them from going rusty. They were originally sourced from the US and were in very good condition apart from an unusualy form of damage. They had been mounted as a display piece and the method of attachment slightly changed the blade set (curvature) and would not cut at all. 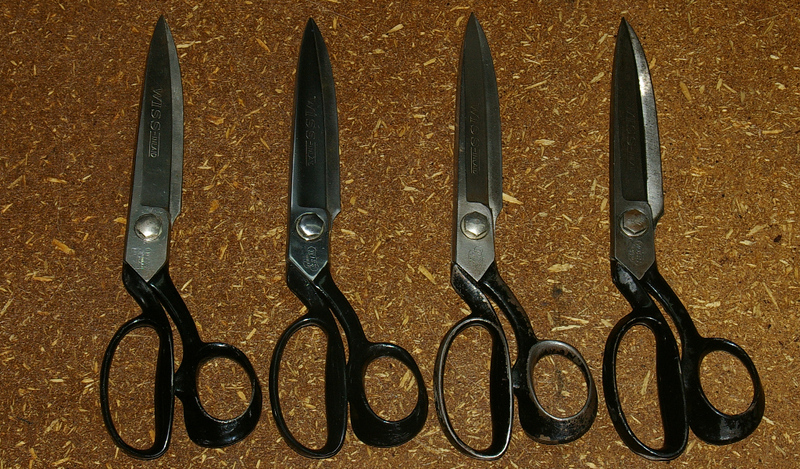 After readjusting the blade set, the shears were hollow ground to get the most precise shape, sharpened and refinished. They are a very strong pair of shears which can easily handle very heavy fabrics. This is a pair of #7 14 inch shears sourced from the UK. They have been sharpened a few times and probably only have 1.5 lifetimes left in them but were generally in good condition and worth the effort to fully restore them. The blades were hollow ground, slimmed slightly, sharpened properly and fully refinished. They are very precise to use, suitable for all but the heaviest fabrics and very low cutting effort to use. They live permenantly on a cutting table and are well suited for almost all general purpose work. This pair of #6 13.5 inch shears were sourced in Australia from a lady by the name of Anastasia who had bought them in Paddington (a suburb of Sydney) about 10 years earlier. They were in excellent condition and did not need to be restored apart from some minor cosmetic effects. They were sharpened, refinished and are near to being a pristine pair of as new shears. This is a pair of reasonably late #5 13 inch shears. By their design and the stamp "Made In USA" makes them either late 1930s or WW2 war production for making garments for the military. They are the smallest size of the heavy series of Wiss shears and are probably the most common as they are not as heavy as the much larger shears made by Wiss. They came from a vendor in Saint Paul Minnesota and were in unusual condition. From what appears to be a manufacturing defect, the shear bolt (main hinge component) would not allow the lock nut to close up enough to set the hinge properly and the blades had an unusual bevel through previous owners trying to use them. The solution was to place the shear bolt in a lathe and machine about 1.5 millimeter off the shoulder so that the lock nut could be adjusted properly. Rather than lose any blade height, the blades were hollow ground to remove the bevel, resharpened and then the shears were refinished. They are effectively in pristine "as new" condition and work well in generaly purpose cutting. This is the largest pair of shears ever made by Wiss. They are a pair of 12n heavy series shears that measure 16.5 inches. They were sourced from a private owner in upstate New York and were mechanically sound but a bit rusty when they arrived. The blades were hollow ground to get under the rust and provide a clean precise inside face then sharpened correctly. They require a person with a very large handspan to fully open them and their weight makes them difficult to use but they do cut with very low effort and will happily cut very heavy fabric. They are probably too large for tailoring and are by no means nimble to use but they are enormously powerful and could be used for near industrial purposes like cutting out ship sail material. Many years ago when it was common to make overcoats from very heavy material like old style tweed, shears of this size and power were suitable for cutting out very heavy material of this type but it would require a cutter with very large hands who could handle the weight. This pair of 15 inch old style Wiss tailor's shears date from between 1900 and 1905. They were not listed in the later Wiss catalogues. They were sourced from a private owner in New York and the owner could not remember how long they had been in his family. They required very little work, pull apart to clean and lubricate the hinge, sharpen them correctly and reassemble them. They are best suited for long straight cuts and perform well cutting lengths from a bolt of fabris. For a pair of shears with very long blades they are remakably strong and have no problems cutting out double layer fleece but they are poorly suited for cutting out complex shapes because of the straightness of the blades. This model is a 20w 10 inch pair of Wiss trimmers. They were sourced from a retired dressmaker via an antique dealer in Sydney. Because of their smaller size and front profile that are very accurate down to very fine detail yet strong enough to cut through multiple seams and generally heavy fabrics. These appear to have been made in the late 1940s to 1950s but Wiss had made this model from the 1920s onwards. You can still buy the modern versions of the W series trimmers in both 10 inch and 12 inch and as the are a lot lighter than the N series tailor's shears, they can be used freehand for trimming tasks. They are no longer made in the US but the quality is still very good and they are manufactured from modern excellent quality steel with very good cutting edges.